International Week at the University of Montana was a success! 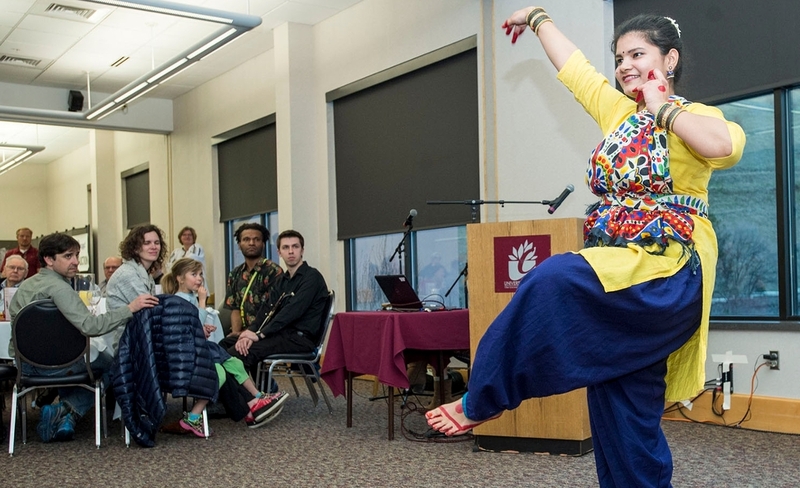 Campus and community members were able to attend up to 14 events associated with International Week, which gave plenty of opportunity for our students, staff, faculty, and community members to engage in international and cultural education. Campus and community members celebrated the start of International Week at a kickoff reception held in partnership with The Branch Center in the UC. That night, Mayor John Engen proclaimed the week of April 3-7, 2017 to be International Week in the City of Missoula. Read the official proclamation. Participants had several opportunities to learn about and engage in cultural education and appreciation through the rest of the week. MFA student, poet, and filmmaker Saif Alsaegh screened his latest work, "Alazeef," in the UC Theater and explained how his childhood experiences in Baghdad have shaped his artistic expression. On Thursday, April 6, over 20 student, departmental, and community organizations participated in the International Fair tabling event to share their work with people passing through the University Center. International Week wrapped up at the International Banquet Dinner on Friday, April 7. This dinner served as a fundraiser for the Missoula International Friendship Program, which has provided community mentors and friends to UM international students for decades. The dinner sold out, and the 130 attendees were treated to a Middle Eastern dinner, cultural performances, the chance to win international goods from a silent auction, and the chance to interact with international community members and students. International Week started with a kickoff reception in The Branch Center. Speakers at the event, who shared the week's activities and the importance of cultural appreciation and education, included Effie Koehn, Interim Director of the Global Engagement Office; Udo Fluck, Special Projects Manager for International Education; and Nathan Lindsay, Associate Provost for Dynamic Learning. The Global Engagement Office hosted a screening of "Alazeef," an experimental short film by brothers Saif and Fady Alsaegh. Saif is an MFA student at the University of Montana and a poet. He shared the creative process of writing, filming, and producing the film via telecommunication with his brother, who lives in Turkey. The film delves into the mind of an unknown Iraqi soldier in the days leading up to Operation Desert Storm and focuses on humanizing "the other." Here, Saif is shown with the poster advertising his film at the Cinéma du Réel international film festival in Paris. Culturally-focused student and community organizations shared their missions, upcoming events, and some tasty treats with people passing through the UC at the International Fair tabling event on Thursday, April 6. Surbhi Jain, Fulbright Fellow and Hindi teaching assistant, applies henna to a student's hand during the International Fair tabling event. Yulianus Kogoya, an English Language Institute student from West Papua, performs during the International Banquet Dinner fundraiser for the Missoula International Friendship Program. Surbhi Jain performs an Indian dance during the International Banquet Dinner fundraiser for the Missoula International Friendship Program. The Missoula International Friendship Program hosted a silent auction of crafts from around the world during the International Banquet Dinner.